And Then and Then . . .
Thursday morning, I woke up to an email from my old mortgage company in Chicago. The subject line read: Easter. It was just the wee hours of Maundy Thursday with all the intense action of Holy Week yet to come. And maybe because my mind was a bit pre-occupied with all the details of that night’s service, along with Good Friday’s, and then the one we had this morning in the old sanctuary on The Hermitage; I opened the Easter message – even though it was a long way to Easter from that early Maundy Thursday morning. Pastels immediately popped on the page in colorful eggs that were underneath a photo of a bat, ball, and catcher’s mit. “HAPPY EASTER,” the message proclaimed in big, beautiful light purple, green, orange, blue, and pink letters. “Dear Jule,” the email continued. “Best wishes for a wonderful Easter filled with sweet treats and the joy of spring.” Then in a special box highlighted with a pretty spring-green background, the message went on: “This weekend we celebrate many of the things that make our country the great place to live that it is. (Terrible English, I know; but it’s a direct quote from the email.) “Easter (bolded out in bright orange) is celebrated on Sunday and brings with it, early signs of spring. The Final Four go at it Saturday evening,” the Easter proclamation continued with a detailed line-up of last night’s games. Then to complete this lesson to me on the true meaning of Easter weekend, the email concluded with the following: “Last but not least, the boys of summer are back on Sunday with the Cubs opening at home on Monday (remember this was from a mortgage company in Chicago) and the White Sox on the road.” So get all excited Jule because so be the gifts of this wonderful Easter day???!!! Almost immediately I wondered if the last verse of the gospel of Mark that we heard just a bit ago was the final word about it all ever echoed through human history. You might remember how this earliest written gospel is believed originally to have ended. The three women, Mary Magdalene, Mary the mother of James, and Salome bought spices the morning after Sabbath’s end they go to anoint the dead body of Jesus. 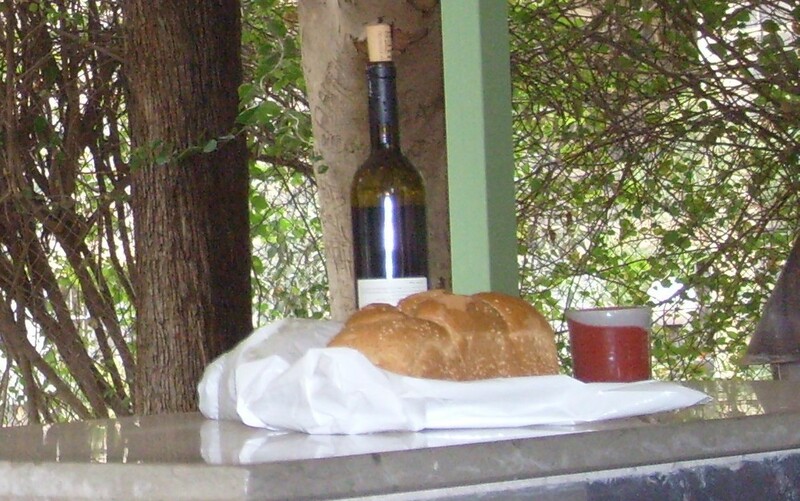 They see the huge stone already rolled away before they get there and some sort of young man dressed all in white is sitting in the tomb where they expected to find Jesus’ life-less body. They’re told not to be alarmed. Though let’s face it, who among us wouldn’t have been incredibly alarmed to find a tomb that held the body of one just brutally murdered by the authorities of the land empty when it was supposed to be full. And whoever this young boy is who is giving them a guided tour around the tomb certainly isn’t helping. “Look, there is the place they laid him,” he is saying. “And see: he’s not here. He’s been raised. Now go tell the others, and even Peter who flat out denied him three times, to head back to Galilee where he will meet you.” (paraphrase of Mark 16:6-7). . . . And so, according to the original ending of the gospel of Mark, the trio of women do what most any of us would have done. They high-tailed it out of there faster than anyone could cheer: “On Wisconsin!” . . . They were seized, the gospel writer records – feelings rising up in them that they could not control. Sheer terror mingled all at once with absolute awe. And because they were so afraid, they didn’t speak a word of it to anyone – not even to one another ever again. They dashed off from the empty tomb, each back to their own hometowns or far away from that land altogether so that you and I are left today to celebrate with sweet treats the return of Spring, the Final Four, and baseball – though if you’re like me, Spring might be the only three of these you’re all excited about. At this point, something in us is supposed to be shouting out: “No!” It’s not enough. Sports and Spring because the first to see, at least according to the gospel of Mark’s telling of that initial Easter morning, were too afraid to tell anyone else about it? Absolutely not! Who among us would be willing to be baptized into that? Spend so much of our blood, sweat, and tears – and laughter, love, and fun times too – being community together if that’s all it is – live a good life, try to tell others of God’s love, get absolutely creamed because of it with no further word from those who were entrusted with the rest of the story but were too afraid ever to tell? Uh-ah. That is nowhere near enough! Through the years a lot of effort has gone into adding other endings to the gospel of Mark. Claiming a few other verses eventually were found. Or writing up a dozen or so more just to make the story of Mark a bit more palatable for readers far from the original event. But there’s a reason we stop the story where we did today. At the end of verse 8 of chapter 16 when the women at the empty tomb leave tight-lipped and too afraid to deliver the message they were given to tell. It’s entirely possible that the writer of the original ending of Mark wants us to get all upset about the story ending there that we might ensure the proper ending takes place. Easter is not supposed to be an event we keep to ourselves. Sure one living again who was tortured and tossed in a nearby tomb because the religious laws of Sabbath said you had to get home to start the meal. Him being alive again is frightening. It turns around the way we thought it always was. That they can mock us and beat us and snuff us out altogether, so in fear we better fall in line. Waste our days on things like baseball and the Final Four – sorry sports fans. But not even pulling for your favorite team is enough. . . . It’s not enough to fill up the precious few moments we have in this life. It’s not enough to keep silent that you sense it all goes another way – even if it doesn’t make one bit of logical sense to minds that too often get stuck on the need for objective proof. What more proof do we need than their fear didn’t actually end up being the end of the story? We literally would not be here if it did! Their awe eventually overtook. . . . The news of a Risen Christ was too good never to speak of again. Maybe they went back home wondering how it all could be so – too afraid at first to speak it in case they’d be the next hung up on crosses by the authorities who didn’t want to hear any talk of hope or everlasting peace or unable-to-be-snuffed-out Love. Death does not have the final word in our world or in any of our lives. So that eventually, if we pay attention enough. If we open our hearts and minds to it enough, we eventually have to tell. The truth of resurrection we’ve experienced in our own lives. Once we too thought we were at our end. And then . . . somehow. We’re still here. Battle-worn perhaps, but still standing. . . . Do you remember the day your heart no longer felt so smashed to smithereens by the storms of life? Do you remember the moment you knew you could go on – even if you no longer wanted to under the conditions life left for you? Can you recall that time you were down in the dirt of it all – rock bottom they call it in the AA movement. And somehow you got up. You, thanks to the same Life Force that again returned to Christ, you again stood up. That’s resurrection in our lives each day. That’s new life here and now and one day forevermore. That’s what Easter is all about. Not sports and Spring, though Spring is a great gift that shows us this ancient truth of our amazing God. That like Christ, thanks be to God, you and I rise again after every little death of this life and one day in full at our end – just like the Risen Christ. . . . It’s the truth of the Christ, the truth of our lives — the truth of Easter – that this world desperately needs to hear. What more do I need to say than: go! Finish the story. Tell the good news we celebrate on Easter which we see in our lives each day! 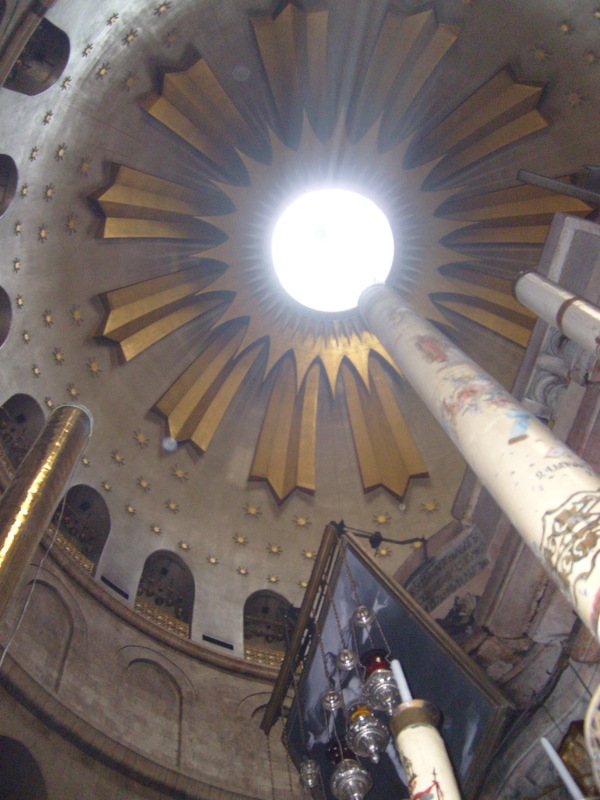 Dome over the Empty Tomb at the Church of the Holy Sepulcher, Jerusalem. Photo by JMN, March 2014. This entry was posted in Sermons and tagged 5 April 2015 sermon, Again Standing Up, Easter Sunday Sermon, Mark 16:1-8 sermon, Resurrection in Everyday Life, The Original Ending of Mark, The Resurrection of Christ on April 15, 2015 by RevJule.